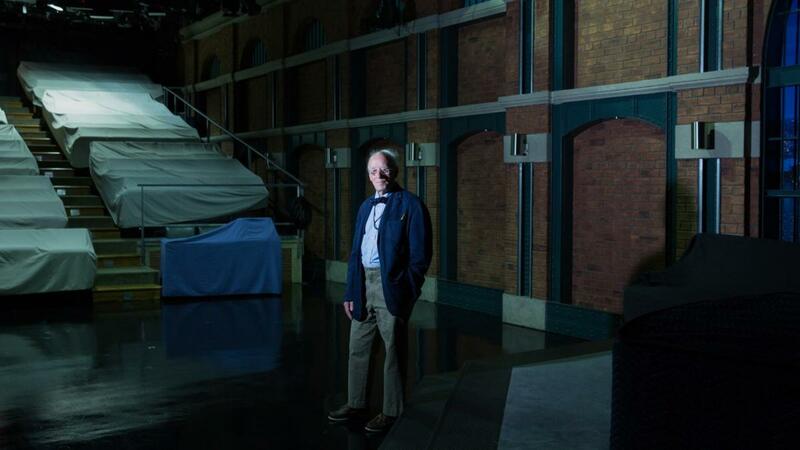 Eugene Lee is a legend around the sets of Saturday Night Live, since he’s been working as its production designer since the very first show in 1975. While his Tony award-winning musical Candide was on Broadway he was personally selected as a production designer by Lorne Michaels, and, well, the rest is history. Mr. Lee had so much to share about his experiences over the years from the guest stars, to his personal favorites, to the crazy sets, and some of the traditions he’s been a part of since the very beginning. Congratulations are in order as Mr. Lee recently won an Emmy in the category for Outstanding Production Design for a Variety, Reality, or Reality Competition Series for the SNL episode hosted by Bill Hader. When I called in for the interview, he was preparing a 30-second video to go along with his nomination, so it’s wonderful to know that he walked away with the Emmy. While the summer is officially coming to a close, Eugene’s year is just getting started with the new season of SNL which will bring with it new guests, new sets, and a whole new experience. Outside of SNL, Eugene has a book that will be releasing circa December 2018 called The Adventures of Eugene Lee which will chronicle his personal experiences and life stories. Furthermore, Eugene is currently having a house built in Whiting, Iowa – where his old friend and collaborator Lorne Michaels has bought a pencil factory. The house will be for Eugene to have a place to stay whenever he goes to check in on the pencil making. If this doesn’t warm your heart, then I’m not sure what will! Read our conversation below as we go back in time to 1975 and see how things have evolved since that very first episode. What interested you in production design and how did you end up at SNL? I’ve been doing what I’m doing since junior high school. I got on SNL only because Lorne Michaels came to town – I had a hit musical on Broadway at the time and he couldn’t find a television person he liked. He saw me, and I got hired. It was simple as that. You’ve been at SNL since day one (October 1975), what was the atmosphere like on that very first day? I’m very sentimental about the first few years. It’s become very formalized and it wasn’t like that in the beginning. We have so many people now, and it wasn’t like that before. For years, me and one other person did everything–you can count the number of people from the first show on one hand. You know the credits that play after a show? In the first years, that was all on black paper rolled up with white letters. And there was a crank on it and the camera pushed up and focused on the letters and they cranked it so the credits went by. So, yes things have really changed. What has been the most unique, unexpected set you’ve worked on since you started at SNL? It’s been so many years! I did Wicked on Broadway which has been on for years, and I’ve done a few other musicals. The theatre I work for in Providence, I’ve worked here for 50 years and I still do a show or two for them. For SNL, some of my favorite sets were the early ones. Things were super simple then such as painting directly on the walls versus what we do now. I’m just sentimental like that. From what I understand, things are built from scratch every week. As a production designer, what is your design process like when you are preparing for a new episode and how much are you collaborating with the rest of the staff? It’s nice to have a summer off because it’s a hard show to do because of the time schedule and how fast everything is. Listen, it’s all good! There isn’t an exact process really. We read the scripts and then with the director we lay out where they all fit in the studio the best they can. We talk to everyone and bring everyone in because writers produce their own pieces. They tell us what they want and we try and figure it out. With some people it’s really easy and they know what they want, and sometimes it’s not that easy. It’s a huge collaboration process but we draw the show out with pencils. This all happens in one day from reading to putting it all together. Scenery has to be especially made because the studio used to be a radio studio so the elevators are really small so everything has to be made into pieces so they can fit into the elevator. On Saturday, we do a technical run through just to see if we can do the show, and then do a dress rehearsal which is the day Mr. Michaels comes in to look at it and tell us if there is anything he doesn’t like, and then we do the aired show! There are often design elements that the audience does not pick up on but you spend time creating and putting together. Are there any such elements for you? Forget the audience! The writers and the new people we get don’t even have a clue how we make the scenery come to life. They have no idea how it gets done, or transported. If you go down under Rockefeller Center, it’s another world down there. So, it’s magic not only for the audience, but even for people on the show. I designed a set that goes along with the Grand Central theme of home base. We used to change it a lot more, but it’s been the way it is now for quite some time and it’s become iconic so it would be hard to change it. Who has been your favorite musical guest to work with? Prince! He had no idea what he wanted and so I went and talked to him in Minneapolis. He was terrific and had an all-girl band. Lady Gaga was really friendly, and Paul Simon was the second musical guest – we’ve stayed good friends. There have been plenty of interesting hosts/guests etc. over the years on SNL such as Alec Baldwin, Melissa McCarthy, Betty White, and The Rock. Who have been some of the most memorable to work with and why? I’ve worked with them all! Steve Martin wrote a little musical and that was super fun to work with. We just try to treat everyone really nice because they’re our guest and everyone has their own unique and fun angle to it. It’s all really nice and everyone is generally always really nice! What are some of your favorite traditions about SNL? In the early years, we had a stuffed cow which was black and white. The design department used to hang him over sketches we didn’t like and then drop him in. SNL vs. Trump: Is This The Best We Can Do?